The original Littlethorpe Forcing Jar was designed in the 1850's for Rhubarb/Seakale forcing. 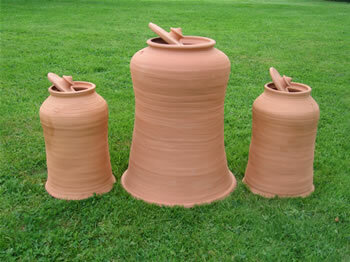 The forcing jar is used to bring the crops on early and keep them sweet by denying them light. This is done by placing the jar over rhubarb crowns or seakale thongs. The base is thickly rimmed to ensure years of sturdy service. The smaller forcer is also suitable for chicory forcing. 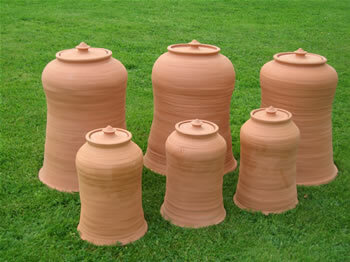 This traditional Littlethorpe forcing jar is an ideal gift for the gardener who has everything. Rhubarb crowns are traditionally planted in winter but need to be left for two or three years to establish before they can be forced. Put the forcer over the crown in winter and leave the lid on to protect it. Once the crown starts to shoot, John Huggins recommends taking the lid off to encourage the stems to grow towards the light. When a crown has been forced leave it to rest for a year to recover. If you're serious about forcing you need two crowns to force in turn. A mulch of well-rotted manure in autumn, when the leaves have died back, will help them recover. Seakale is forced in similar way. Buy seakale as root cuttings or thongs and plant them in spring. Leave them to grow for at least a year before forcing in the same way as rhubarb. Seakale plants don't need to rest between forcings, but after three years it's a good idea to replace them. You can do this by taking root cuttings from the spent plants.